Child support is set by state courts under guidelines established by state laws. Federal benefits, like those administered by the Department of Veterans Affairs, are not subject to state laws or state court rulings; federal rules govern when and how veterans benefits can be distributed. This means that you must work under federal guidelines when determining whether your ex-spouse's disability payments will be considered as income when establishing and collecting child support. Child support payments are typically based on a calculation involving each spouse's income. These calculations are based on state guidelines, and each state's courts can set child support in different ways. Generally, monetary veterans benefits, like disability and retirement pay, are considered income for child support purposes. Thus, even if your ex-spouse is not employed and has no other income, he can still be ordered to pay child support based on his income from veterans benefits. Non-monetary benefits, such as medical care or commissary privileges, are typically not included as income. Even though your state court orders your spouse to pay a certain amount for child support, it can be difficult to collect that support if he is unwilling to pay it. Frequently, a paying parent's employer can withhold the money directly from his paycheck, but that isn't quite as easy to do with disability pay or other VA benefits. Since VA monetary benefits are generally considered as payment for disabilities or wartime service rather than as remuneration for employment, benefits cannot be garnished, or seized, by a state court's order unless an exception applies. 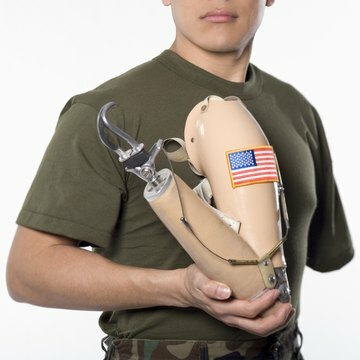 One common exception is for disability pay that is received in lieu of military retirement pay. For example, if your ex-spouse retires from the military with a pension of $2,000 per month, that money would generally be eligible for garnishment for child support purposes because your ex-spouse receives that money from employment in the military. If your spouse is considered disabled under VA guidelines, he can elect to waive some of his retirement pay and receive it as disability compensation instead. If your spouse waives $500 of his retirement pay to receive $500 as disability compensation, that $500 is still eligible to be garnished under VA guidelines. Thus, your ability to access that money for child support remains unchanged. If you are unable to garnish your spouse's disability pay because it does not qualify as payment in lieu of retirement pay, you may still be able to receive a portion of his benefits under the VA's apportionment program. Under apportionment, you can ask the VA to send a part of your ex-spouse's disability benefits directly to you as part of your court-ordered child support. The VA will not grant an apportionment request under all circumstances, such as when the veteran receives a very small benefit. The VA will consider whether evidence supports the idea that your children need financial assistance and that taking money from your ex-spouse's benefits would not cause a financial hardship. Based on all the evidence available, including evidence submitted by you and your ex-spouse, the VA decides whether it would be appropriate under VA regulations to give some of your ex-spouse's benefits directly to you as support for your children.